As you might know Google Reader is going to shutdown on July 1st, 2013. I’ve been using this service even before I owned my very first computer. It’s sad to see it go away, but despite all the complains from the users, Google still intend to shutdown Google Reader when the time is up. The news came out in early March this year, that leaves people about 4 months to make a decision to go somewhere else. 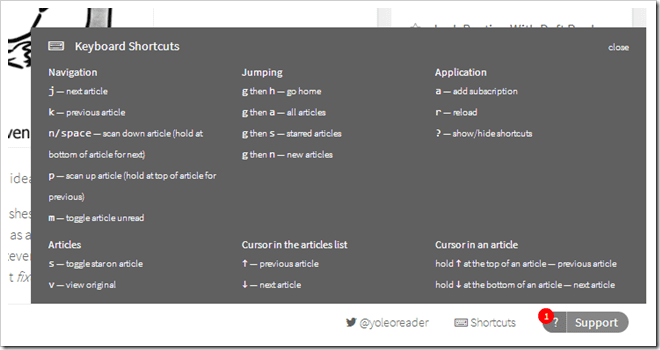 If you have already found a home to consume all your RSS feeds, good for you! I’m one of those people that will only switch out on the last dying breath of this product. We’ve covered a few alternatives to Google Reader here and here. If you are still in the market in seeking for a great alternative. You’re in luck today. When it comes to pick the next “Reader” I’m keen on a great user experience. Easy to use and look slick, I believe I’ve found my answer today. 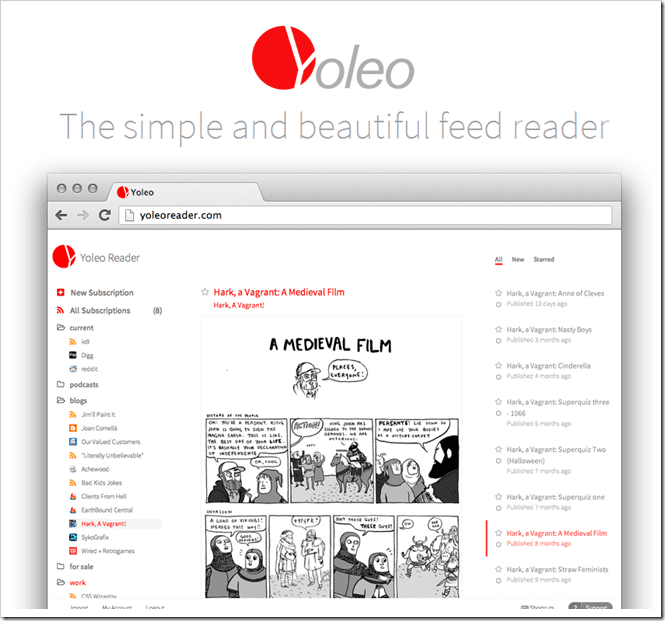 Yoleoreader meets the criteria, it syncs the feed straight from Google Reader, it has the same keyboard shortcut I use when I was using Google Reader, and lastly it looks awesome. 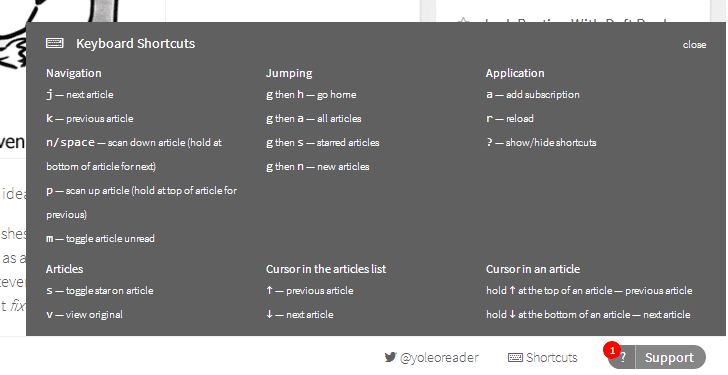 Yoleo contains most of the keyboard shortcuts to navigate around. You can see a list of keyboards shortcuts and combinations by clicking on the “Shortcuts” section. It got pretty high attention on the initial launch, as you can expect with many other great online tools on the initial launch, the server might not be able to handle all the traffic it generates. The import process might take some time, for me, it took more than few minutes to import all the RSS feeds. So don’t get discouraged when you think it doesn’t work, it does, just take some time for now for the server to fetch all the RSS feeds you’ve got. If you like the product, Yoleo is accepting donations for $9/year. 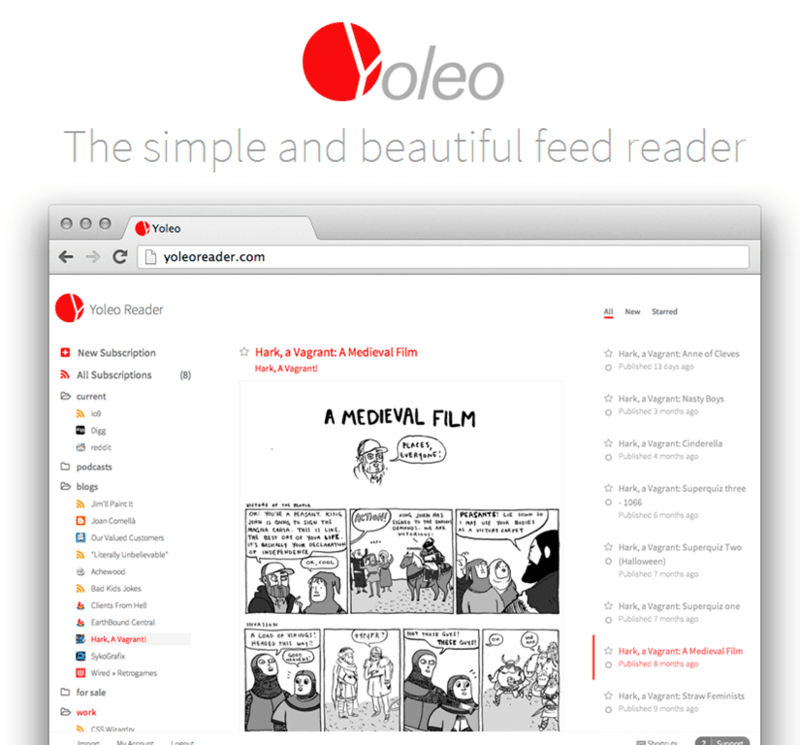 account on Yoleoreader and imported my feeds. 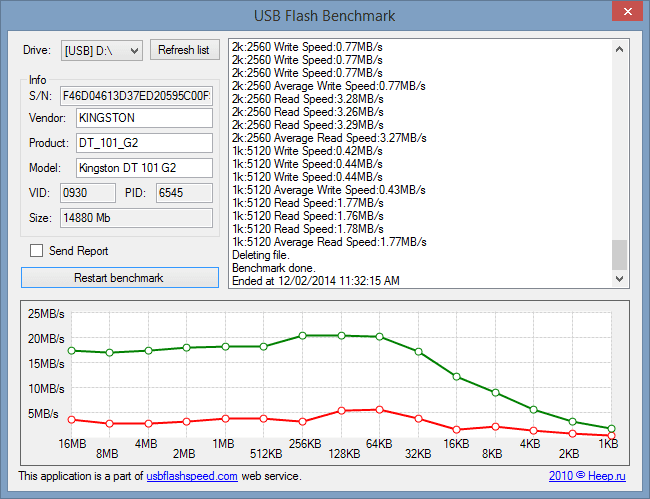 The user interface is nice but the server rebooted during my feed import. I tried again but the feed still has not loaded completely. I guess they are having some problems scaling the system up for more users. The support person was nice but I think I will wait a week before trying again. Since I have a self hosted site and experience installing web software, I installed Tiny Tiny RSS. The UI is almost as nice as Yoleoreader and most importantly it works. I’ve switched over to Feedly almost immediately after I heard the news. It’s been great for me. The only problem, I can’t use it on my Surface RT tablet, though I heard that they are working on a native Windows 8 app for it.